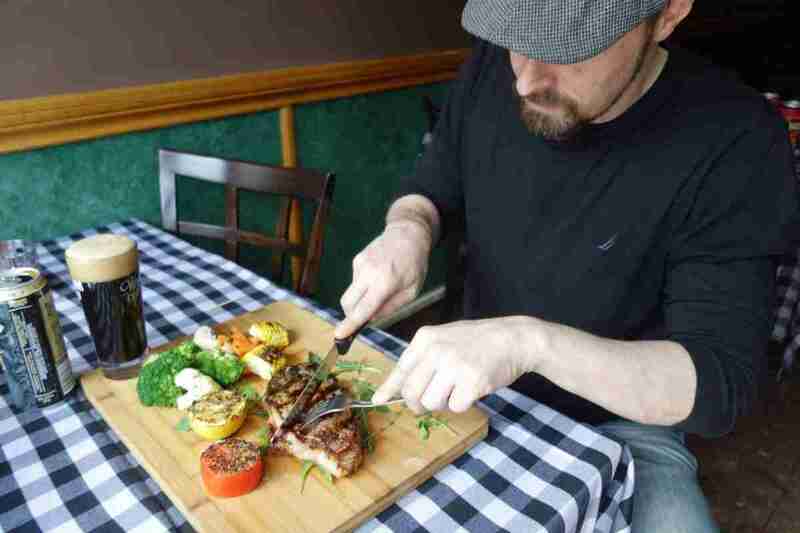 Amico’s Pizza is proud to supply Parkdale with authentic Italian cuisine, and late night pizza delivery, but readers should know our fare often travels well beyond the city limits. 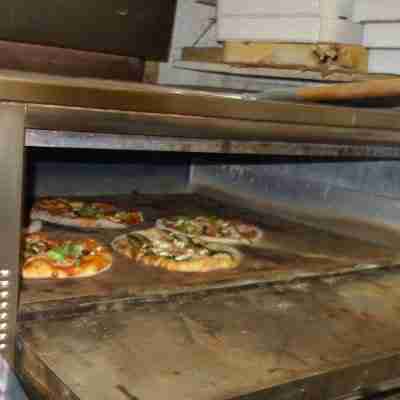 In the summertime, our patrons take pizzas with them when they head-out to escape the urban core. Many families migrate to lake-front cottages and family farms and Amicos goes with them in the car. When of our friends take long hikes in wooded areas and have pizza picnics high-up in the hills. Last week, when six rock climbers came shopping for a meal they could eat in the car, they got a swell deal from Frankie who supports summer fun. 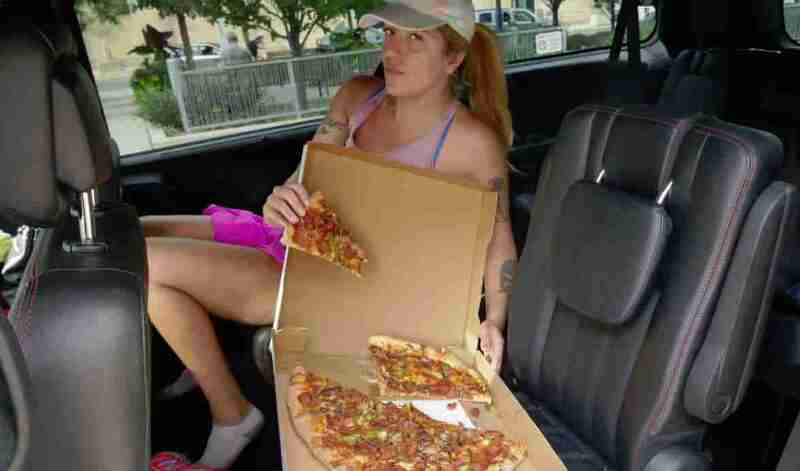 Six rock climbers wanted a deluxe pizza for their after-work car ride to a nearby climbing gym. One of the rock climbers en route to Hub Climbing was Raymi the Minx, who wrote about her rock climbing adventure. The climbers drove to Markham (in Rush Hour traffic) to participate in an evening team-building exercise at Hub Climbing, rock climbing and bouldering gym at 165 McIntosh that involved climbing tall walls with the use of autobelays and helping each other over various man-made obstacles in the gym. The activity also introduced the six participants to a new sport called bouldering which is the act of climbing over things without using safety ropes. If and when they fall, the participant lands on soft mats that are set out to cushion clumsy climbers. One of the lessons that was taught in the exercise was how to fall; its not as easy as it looks. And then the group put on harnesses and learned how to fall from a great height. The group spent a long time and burned a lot of energy doing speed climbs. The fastest climber up the wall found honour among their friends on Facebook. The speed of 9.94 seconds was the best time up the twenty four foot wall; the best climbers used less than nine boulders to propel themselves up the incline. The group had a blast at Hub Climbing and Amico’s Pizza was an important part of the adventure. Casie Stewart wrote about rock climbing at Hub on her blog and included lots of little details. Thanks Frankie for the pizza pie supper that gave this group the strength to ascend. 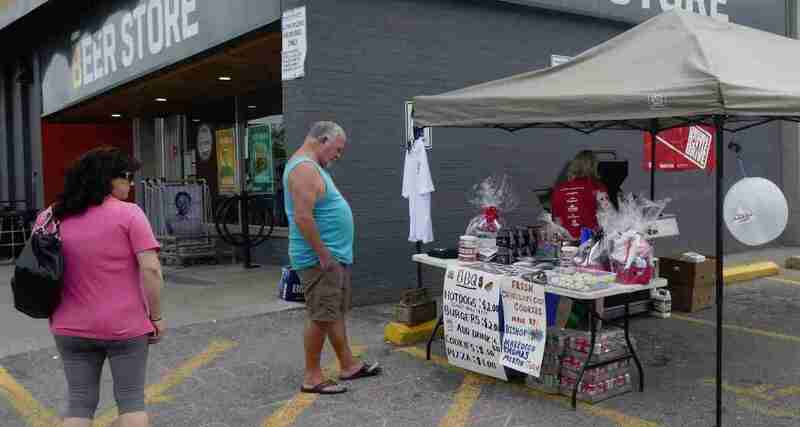 On a beautiful warm Saturday, the 26th of May 2018, the Beer Store at Dupont and Symington Ave (Store # 2318, at 323 Symington Avenue) joined all the other locations across Ontario in their annual Returns For Leukemia fundraiser. 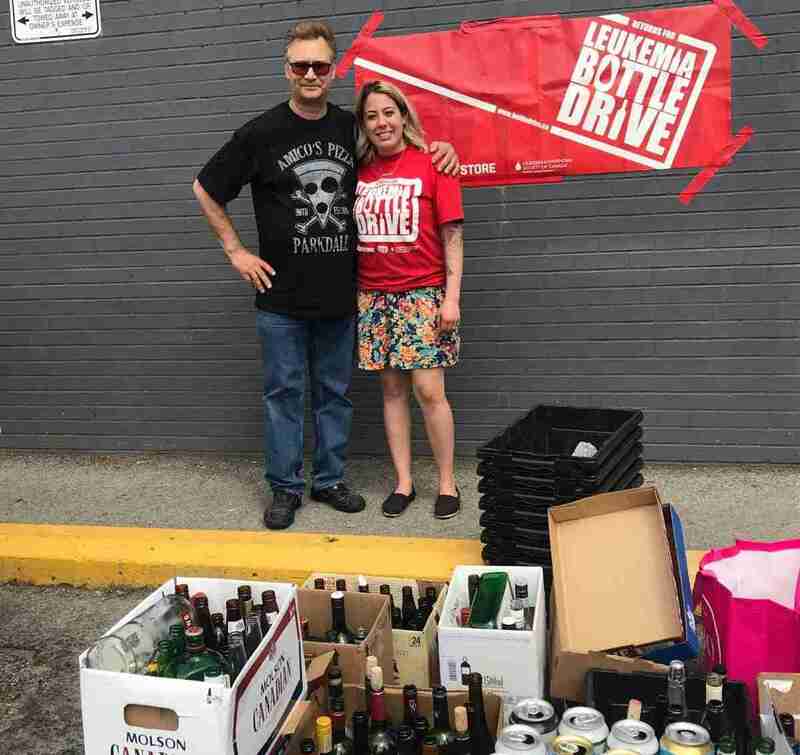 This charitable ‘bottle drive’ initiative is made possible by efforts from the United Food & Commercial Workers Local 12R24 and The Beer Store, and it is quite remarkable how well it integrates with the community. 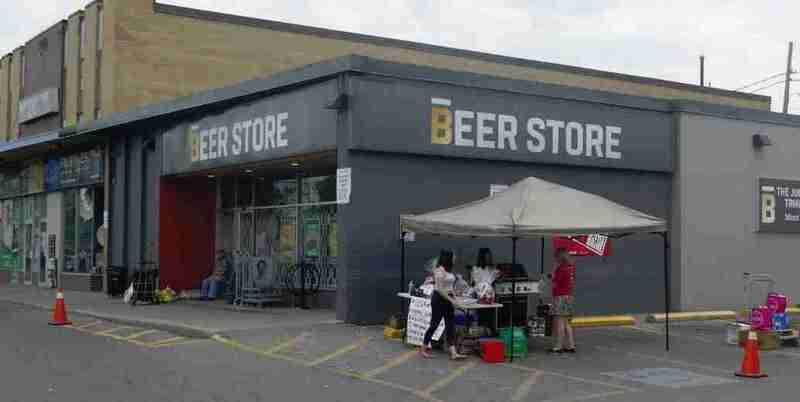 Many different businesses come together in partnership with The Beer Store to raise funds for The Leukemia & Lymphoma Society of Canada. 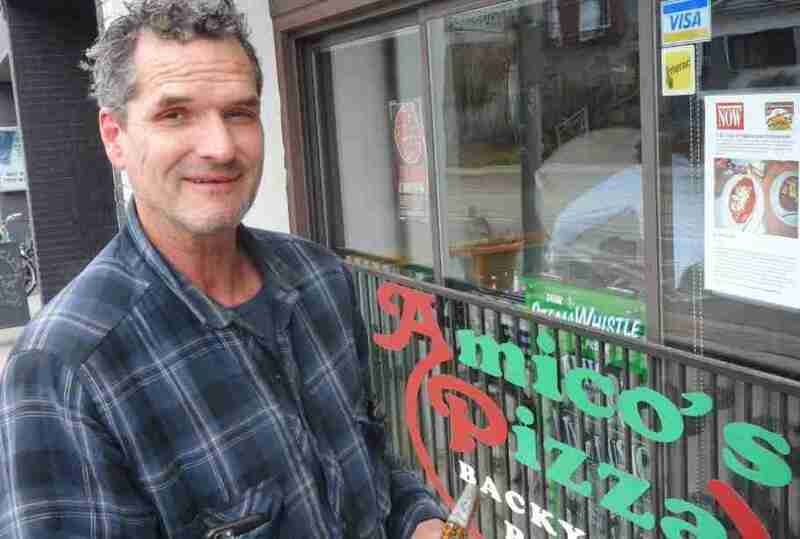 Amico’s Pizza is just one of many sponsors. In 2016 the annual Returns for Leukemia Bottle Drive campaign raised $1,652,012.24 , and in 2017 the charity $1,804,912.24. Who knows how much they raise this year, but it was a beautiful day on Saturday and so we expect big totals from across Toronto! Over the last twelve years, the Beer Store and UFCW Local 12R24’s contributions have raised over $12 million dollars for this worth cause. Read the sign: pizza is one dollar per slice during the Returns for Leukemia bottle drive! 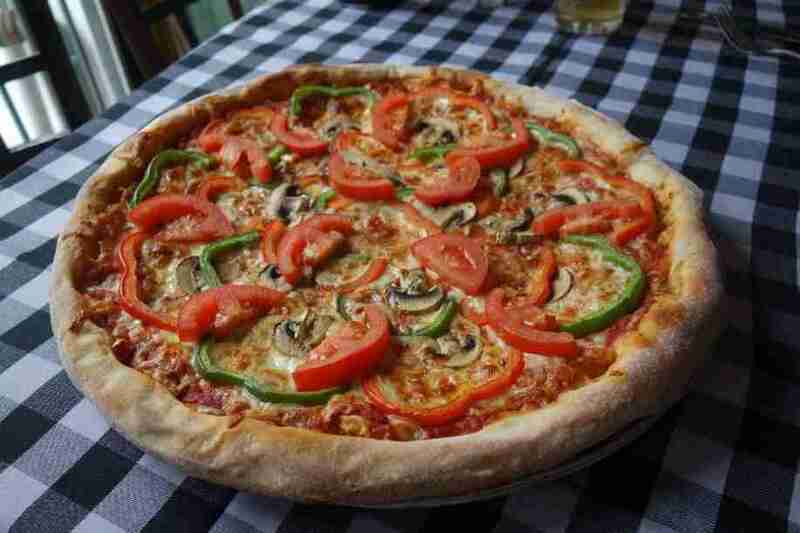 That’s the best price anyone could ever pay for real Italian pizza, served hot and fresh, anywhere in the city. Volunteers are the heart and soul of the Returns for Leukemia bottle drive. These local ladies are the bosses; they are each conduits for independent business and education institutions’ participation. These multilingual young charity workers are having fun doing good work, being part of the fundraising . They counted empties, cooked burgers, and washed cars as necessary throughout the day until 4pm. Car washes were five dollars each, and very comprehensive. The Leukemia & Lymphoma Society of Canada (LLSC) is the largest voluntary cancer research agency specifically focused on finding cures and better treatments for blood cancer patients. With the scope and scale to fund many projects at the same time, LLSC supports hundreds of cancer scientists around Canada. What exactly did Amico’s Pizza donate? and Why? 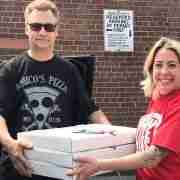 Frankie, our faithful leader worked hard to create a half dozen pizza pies that hot Saturday morning and then he drove the food to the location and helped set-up the dispensary in such as way as to keep the supply hot and fresh. If you follow the money, the proceeds from our pizza donation will help encourage scientists around the world to pursue blood cancer research. Grants to young scientists help grow research talent even as federal research funding becomes increasingly limited. The latest push is for more “targeted therapies” that kill cancer cells selectively because by hitting specific molecular targets, the treatments don’t harm patients’ healthy cells, resulting in fewer dangerous side effects. Our donation will also help test immunotherapies. Immunotherapies strengthen a patient’s own immune system so their own bodies can better fight infections and attack cancer cells, reducing the need for damaging chemotherapy. But perhaps the most important work that LLSC does is provide a wide array of programs that link newly diagnosed patients with trained volunteers that help cancer patients in day to day life and help families make informed decisions. LLSC supplies information and counseling to help guide patients through their cancer journey and access current treatment and clinical trial options. 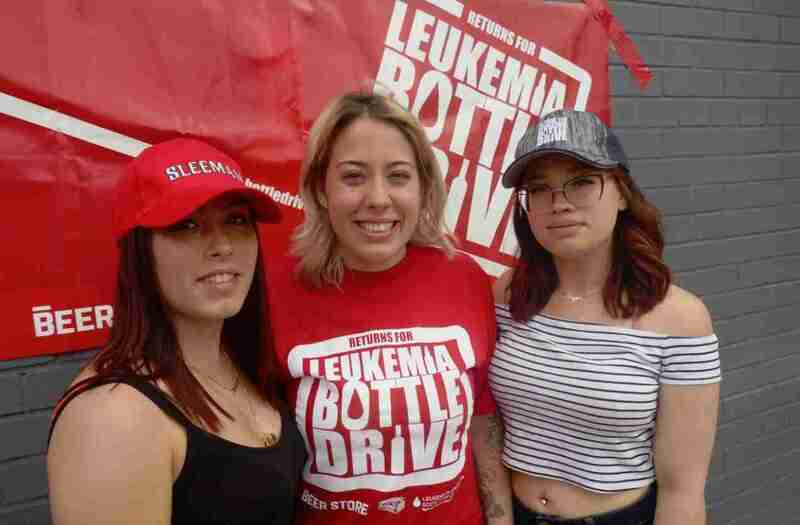 Keep your eyes open for this unique medical mission – your own donation of time, money or beer bottle empties can help the fight against blood cancers at The Beer Store on this special weekend in May every year across Ontario. 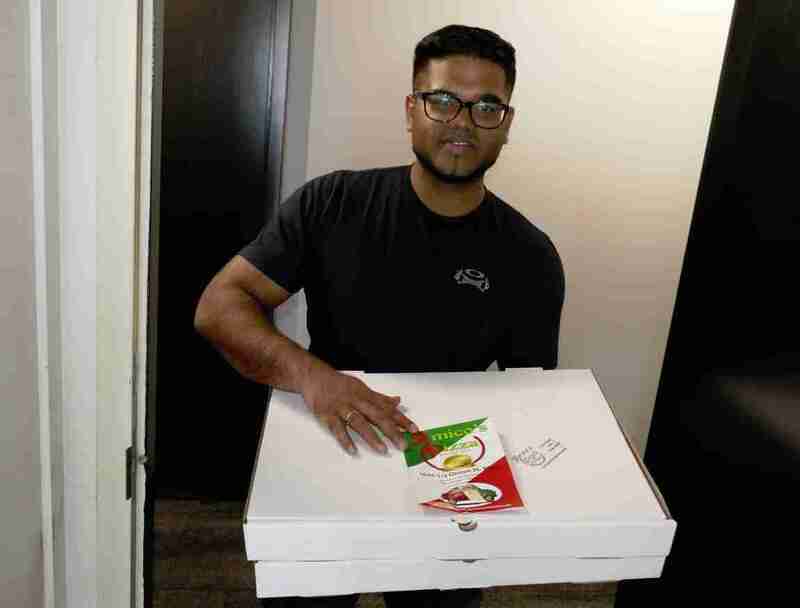 Amico’s Pizza kitchen staff did double duty in the heat of July and August 2017 when they donated meals and prepared ‘Supermodel Survival Packs’ in connection with two national level beauty pageants. 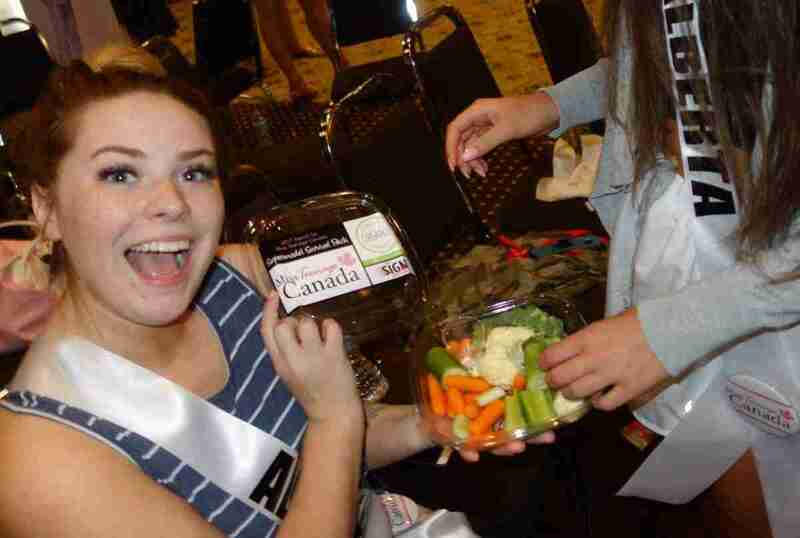 Delegates participating in the 2017 Search for Miss World Canada and the 2017 Search for Miss Teenage Canada went a little less hungry thanks to the chef and his passion for portable food. 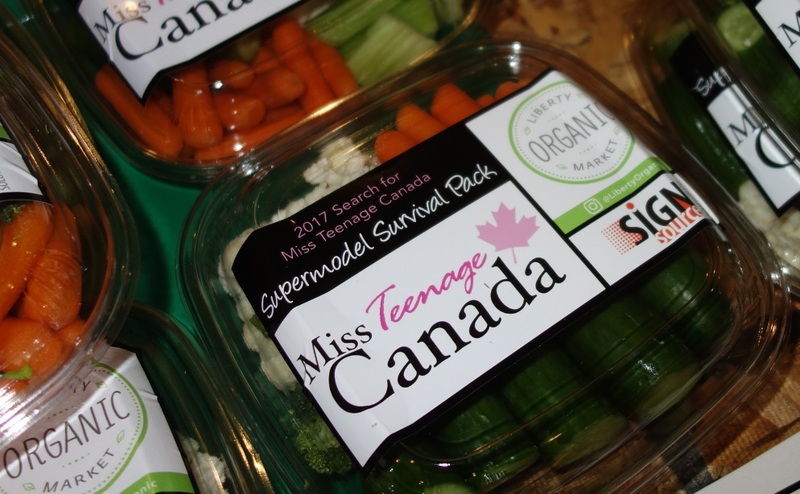 The 2017 Search for Miss Teenage Canada enjoyed Amicos Pizza Supermodel Survival Packs at their hotel headquarters in North York. These handy nourishment containers came in two flavours; ‘Protein Power’ and ‘Vegetable Overload’ together could replace a meal. Both packs really hit the spot, especially during dance practice. Here are the ‘Vegetable Overload’ type MTC 2017 Supermodel Survival Packs that were made and donated by some local grocery stores who were also sponsors. They made these up to feed the girls during their long hours of rehersals. The stickers were printed by Sign Source Solution in Vaughan and applied to the plastic vessels as they were filled with fresh produce. All together over two hundred and fifty Super Model Survival Packs were made and distributed to the delegates of both pageants. The packs made by Amicos had one hard boiled egg alongside two sticks of Cheddar cheese and soft Greek style pita bread with red seedless grapes and fresh cut English cucumbers. The packs below were from local grocery stores and had broccoli, cauliflower, baby carrots, and cucumber and came with dip (Ranch dressing). Together the two packs could replace a meal. The delegates devoured a couple hundred of these packs while practicing for the final dances and they took whatever was left over to munch on later in their rooms. Supermodel Survival Packs offered delegates healthy food options, anywhere and at anytime! Miss World Canada distributed their Supermodel Survival Packs to delegates on 18 July Fitness Day at a health club. 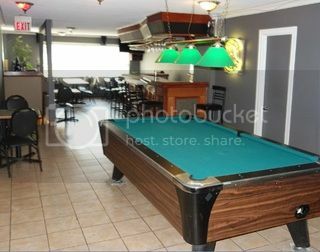 Mayfair Clubs Lakeshore has a healthy bistro and they supplied lunch. But after all the exercise and all the girls swimming in the saltwater pool recording their #SaltwaterSelfies the meal was appreciated and became necessary ‘bus food’. It was enjoyed enroute to the next event and it you’ve ever experienced one of these things then you’ll know there’s always another event. *After the pageant finale there was an after-party at REBEL and then another party after that. To get a glimpse of what actually happens during a beauty pageant’s ‘experience week’ take a look at the media made by Cognition Video Production Company in Toronto who captured the mood in a ninety second sizzler showing all fifty seven ladies out on the lake. The video showcases over a hundred moments and nicely encapsulates the entire expedition from boarding to disembarkation at 2:30 pm on a cruise aboard Mariposa Cruises vessel Oriole. Dance practice happened all week long in the hotel ballroom, with new steps and sometimes whole new numbers being learned everyday. With all this daily excitement, its especially important for delegates to eat healthy meals and stay strong – Amicos’ Pizza is here to support all aspirations toward greatness and gourmet lifestyle. Healthy Pizzas for Hogtown Wrestlers at Super Slam Five! On Sunday June 4th 2017, we cooked up a half dozen party sized pizzas for the performers squaring off in the ring at Hogtown Wrestling’s Super Slam Five. Preparing these party-sized pies is an honour and privilege that our pizzeria takes very seriously. We directly sponsor this extravaganza, and donate the food to celebrate the courage of these remarkable athletes! 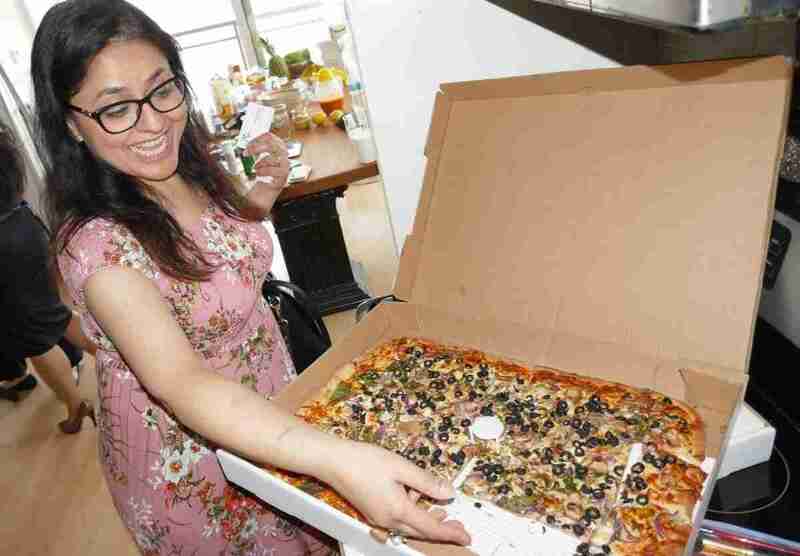 That afternoon we made six different extra large pizzas with two vegetarian options and delivered them steaming hot from the oven straight to the downtown venue. When making this particular delivery, Frankie usually brings a driver so he doesn’t have to look for parking. He doesn’t want any delays to prolong this delivery. 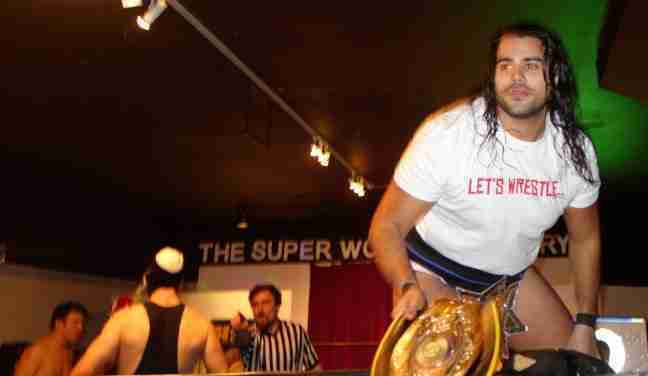 Super Slam Five was special, and not because it was the last episode of the Hogtown Wrestling league’s Roger’s Community TV c0ntract, a revenue source which has sustained the organization and its many performers for years. But rather, because it marks a new beginning for this unique sports storytelling syndicate. Despite advancing into uncertain times, the Hogtown wrestlers staged a terrific show featuring a ten man tournament (five bouts of one on one wrestling) ending in a final five man circle match to crown a new champion. A freshly donated mannequin from a store fixture company was completely destroyed during this final match and it’s bone white arms and legs used as cudgels by the contenders in the ring. After ten or more minutes of vicious brawling, the D-Man Daniel Parker eventually came out victorious with the final pin-fall victory over Nick Watts. But that wasn’t the end of the story. On that fateful Sunday afternoon the master villain Mysterion made another appearance to conscript the D-Man into his evil alliance. His chilling eulogy for Hogtown’s TV contract at the end of this historic event added even more uncertainty to the future of the enterprise. 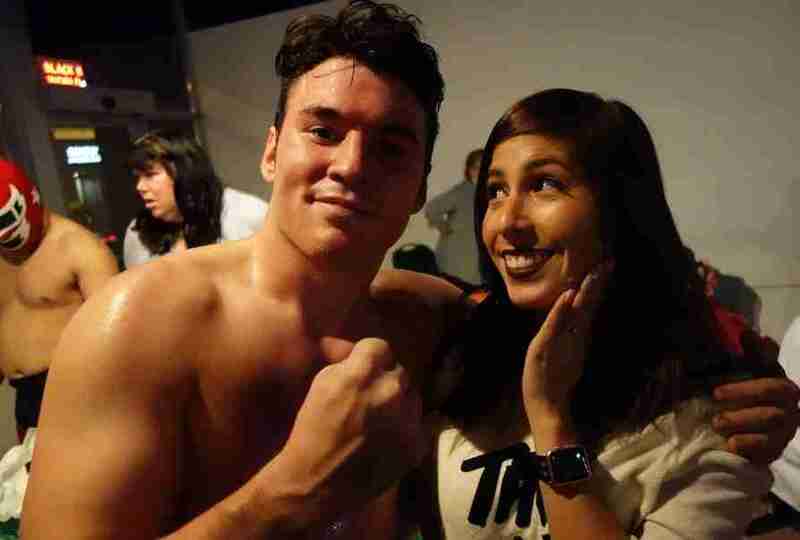 Will Hogtown Wrestling survive? 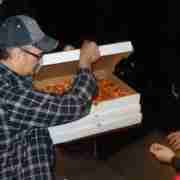 If the league can persevere, the performers can certainly continue to depend on Amico’s to provide pizzas at every show. https://www.amicospizza.com/wp-content/uploads/2017/07/amicopizza-frank-check2.jpg 408 790 Markus ../wp-content/uploads/2019/01/amicos-logoWordpress-Logos0D340x156shdw.png Markus2017-07-03 16:12:422017-07-03 16:12:42Healthy Pizzas for Hogtown Wrestlers at Super Slam Five! 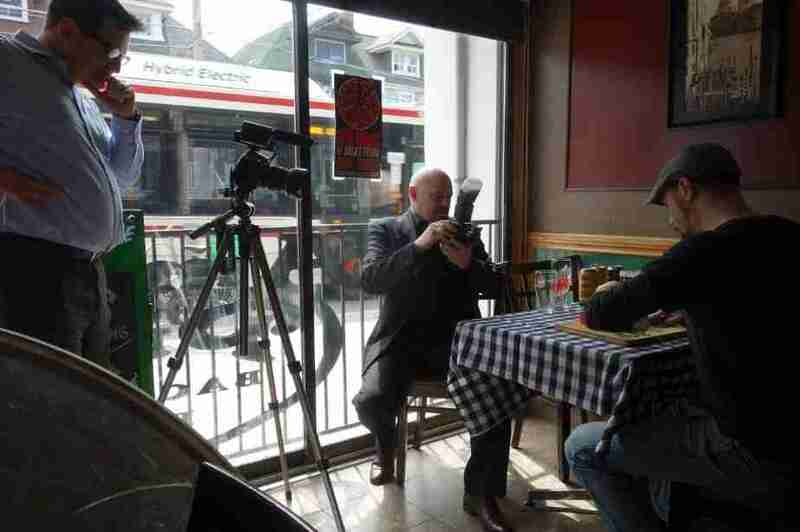 It was a happy occasion because Frank Horgan here at Amico’s Pizza does indeed have a great many friends in Parkdale, and many familiar faces dropped by that day to get in the pictures and help out with the marketing (and eat free pizza and pastas). Nobody Minds Helping Marketers When They Get Free Pizza! Here is our amico Bill Kinch who dropped by for some pizza – in fairness he wasn’t really dressed for pictures as he had no idea what we up to, and we’ll never tell him we used this picture here either..
Bill Kinch dropped by for a slice of pizza in Parkdale which he paid for with his smile. Inside the downstairs dining room area a photography studio evolved around a steaming plate of the lamb chops. That’s the CEO of Hashtagio John Macintosh holding the light bounce for Roger Metiever of Table of the Week. 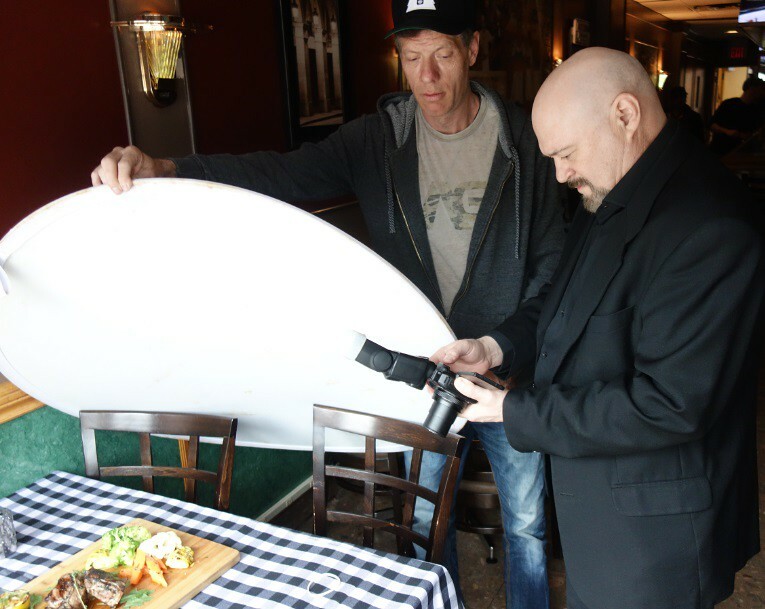 John Macintosh holds a light bounce over the lamb chops dinner that Roger Metiever is photographing for Dine Palace restaurant guide. 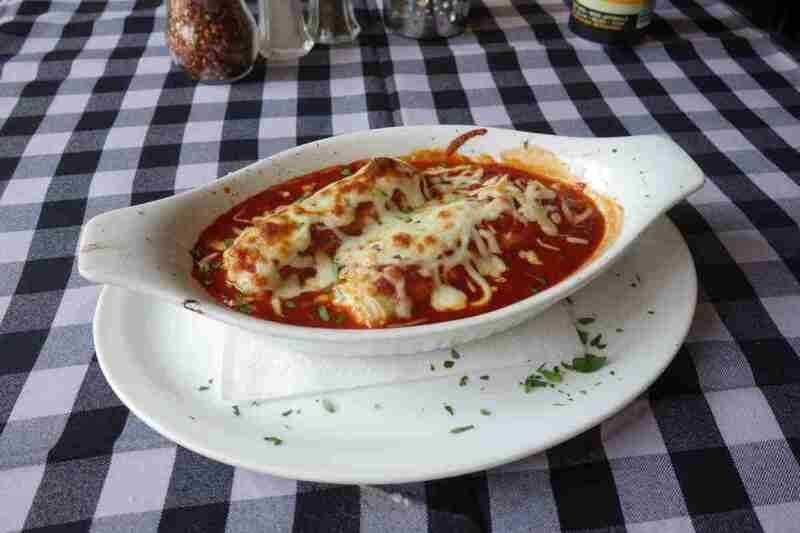 And that plate was followed by the Cannelloni in tomato sauce smothered in mozzarella cheese – this is one of Amico’s Pizza’s most understated meals. This dish is delicious. 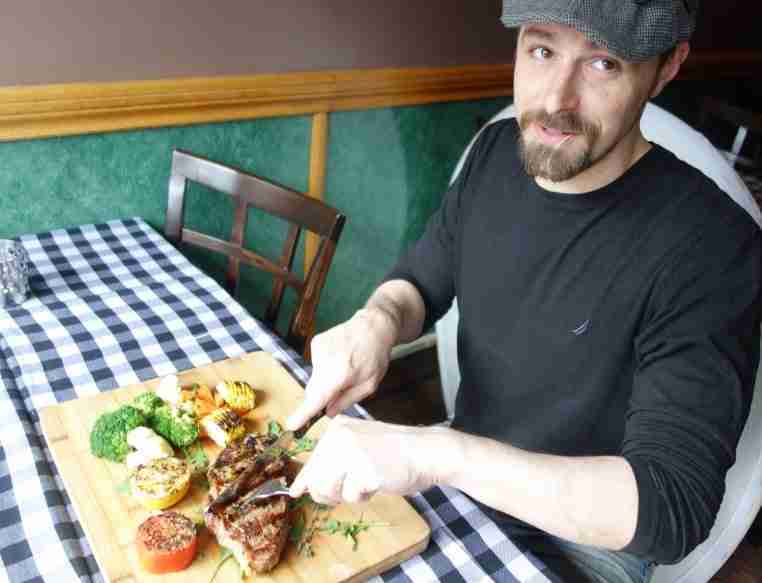 Markus said ‘Okay now we need to see some people enjoying these beautiful meals.” And that was Jay Nadler’s cue (Hutch Henries at Hogtown Wrestling) to sit down and eat a gorgeous 12 ounce rib-eye steak. 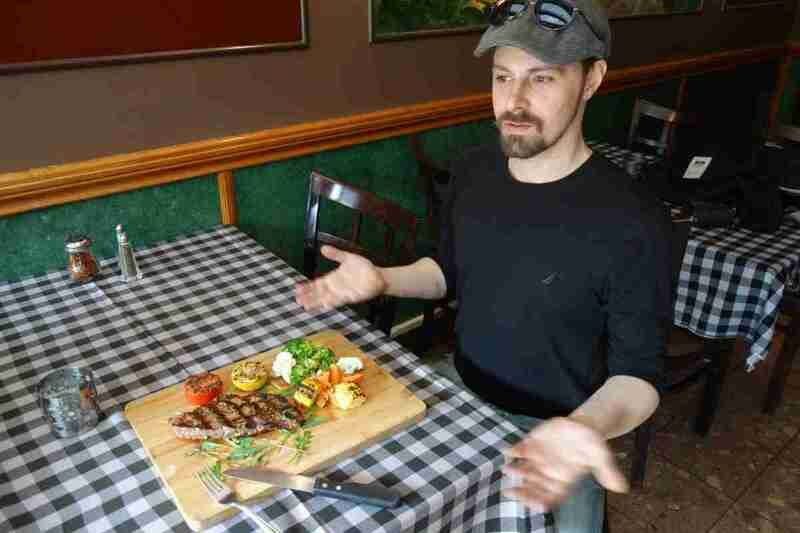 Jay let us all know that he was absolutely starving, Okay Jay how about a delicious steak? 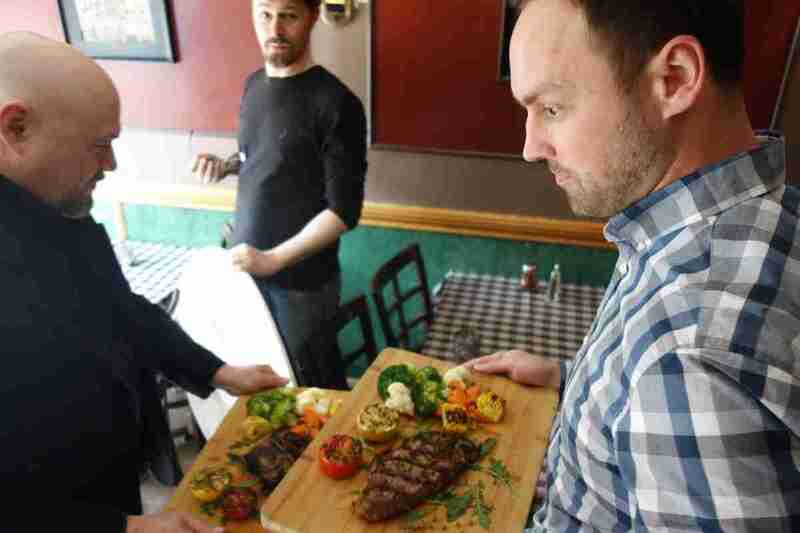 Dine Palace has special lights and filters for shooting meat and especially steak in daylight. Jay asks why there is no beer on the table? 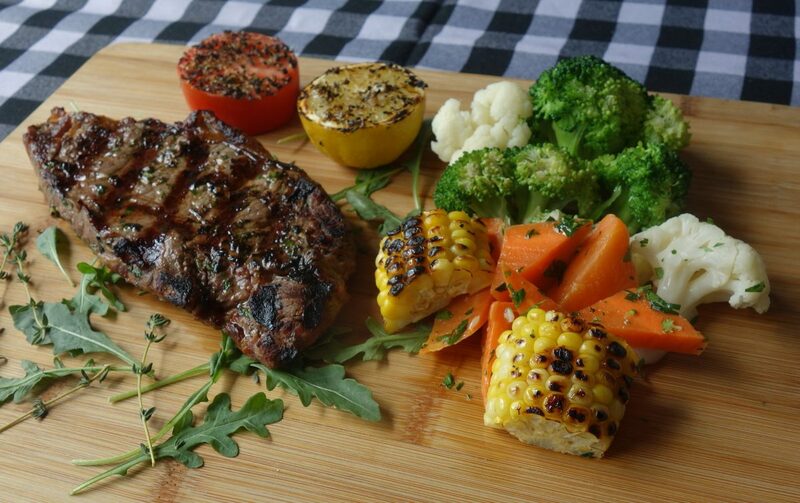 Who would order a steak without wine or beer? 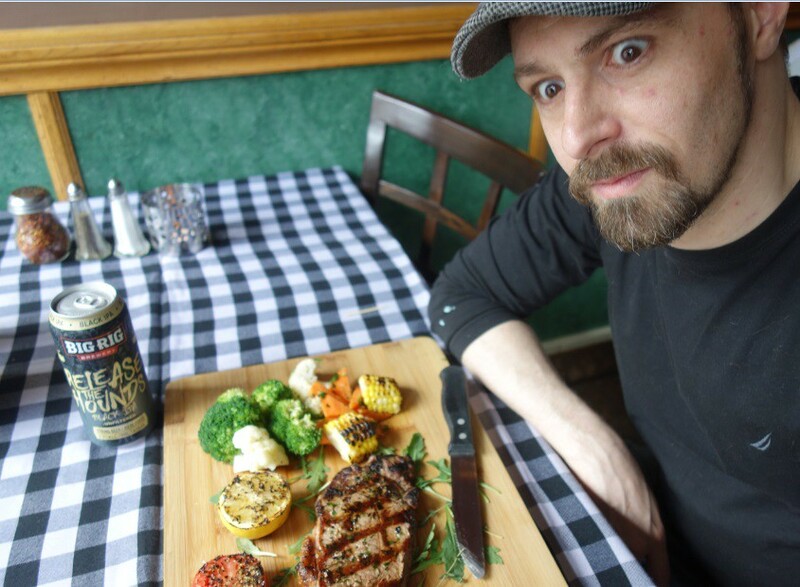 The juicy steak drove Jay mad with hunger. . .
Jay is struggles to control his hunger. When finally unleashed, Jay Nadler chewed that steak like a savage – he ate the meal like an animal attends a fresh kill. This is just one turn of events that occurred while photographing the entries… Now can you imagine how much fun we had shooting the desserts? 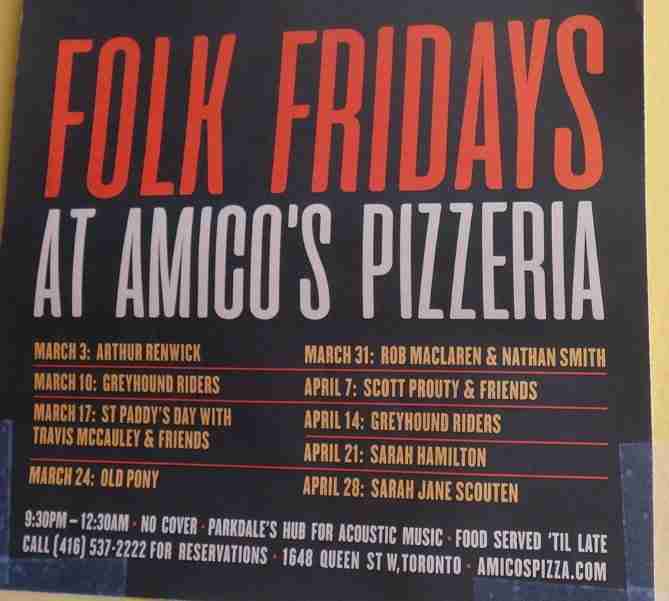 Folk Fridays at Amico’s Pizza is a popular musical event series with an all-star line up of folk musicians from across Ontario. Friday April 14th – Don’t miss The Greyhound Riders, a Toronto based folk band made up of two full-time members, Celina Di Cecca on fiddle, viola, mandolin, ukulele and vocals and Tony Nesbitt-Larking on guitar, and percussion. Friday 21 April 2017, the lovely and talented Sarah Hamilton Toronto fiddle player will perform live! Born and raised in Whitehorse, Yukon, Sarah has been playing fiddle since the age of six, and started performing professionally at the age of 14. She’s the driving force in The Done Gone String Band accompanying groups such as Reuben and the Dark, and Spencer Jo and the River Ramble in Calgary, Alberta. Sarah is now located in Toronto, Ontario where she’s singing and playing in the Pigeonhawk Stringband and local swing orchestra Combo Royale and has just released her first solo recording, engineered by the legendary Bob Hamilton at Old Crow Recording. With that in mind I reckon there’ll be CDs for sale at this show. Friday April 28th the last show in the Folk Friday series will see Sarah Jane Scouten perform upstairs at Amico’s Pizza. Discovered by Vancouver label Light Organ Records when she was cold-called into the studio to make an EP with the prolific music producer Andy Bishop as part of a series of releases, coined The Railtown Sessions (links here), Sarah’s career has blossomed ever since. She has performed on big stages with majors artists all over Canada but now calls Parkdale home and of course she loves Amico’s Pizza. 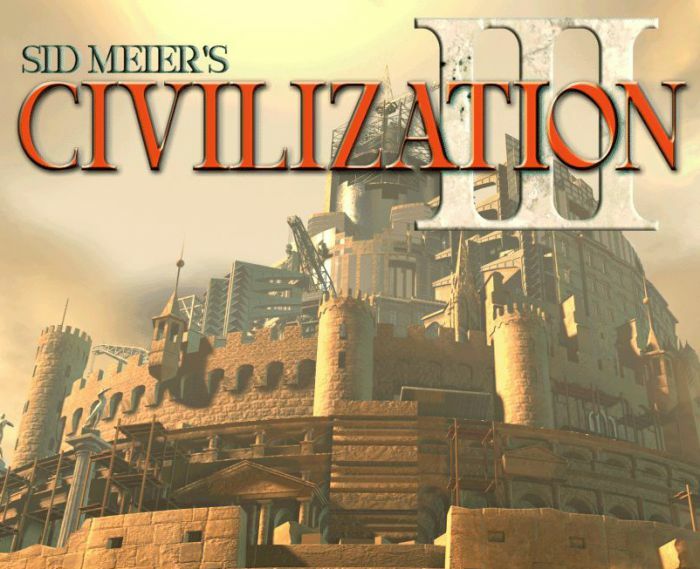 Come play Civilizations III in an epic struggle against seven human strangers in an old school LAN (Local Area Network) Party at Amico’s Pizza. On Sunday Jan 15th 2017 we’re taking over the upstairs of the restaurant for the entire day, and probably well into the evening. 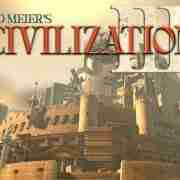 Come play Sid Meir’s CIV3 the way it was designed, against seven human players. Why CIV3 and not 4, 5, or now 6? because CIV3 is the last of the LAN – we’ll need the CDs! Bring yours – come jack in we play Civ3 today because its the quickest and best multiplayer experience. There’s no pesky religions to miss out on, and you can stack troops and the scramble for finite resources is brilliant as they often appear on the borders.. Its a well conceived blend of strategy and luck and perhaps a perfect isotope of the game, certainly the best version for a LAN party. RULES – We play the best of three starts – that means we start three games and play each start for five turns, then we vote to play one game forward to the end. That championship game is expected to last until five or six pm but could continue until midnight – until one player remains. There will be prizes! 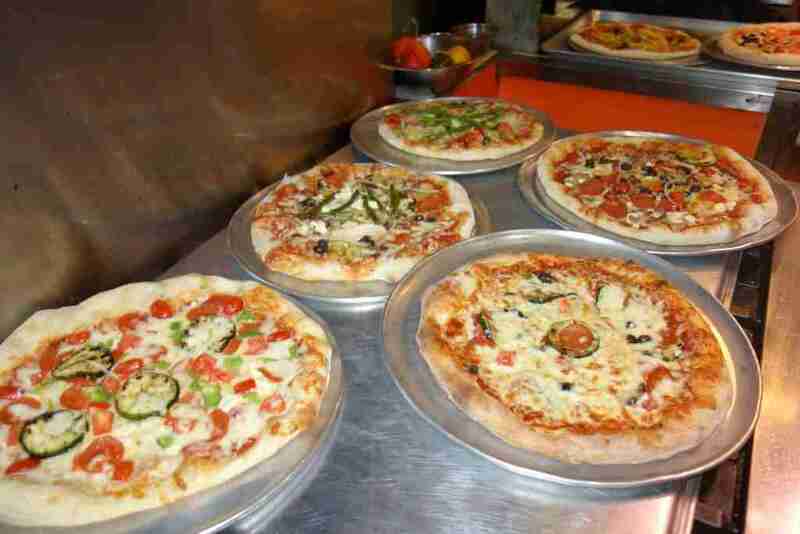 and the winner will take home a free family sized Amicos pizza provided the kitchen is still open when the game ends. The player that’s in the lead in the scoreboard could suffer the small discomfort of having their screen rebroadcast on the central big screen TV in the room so their game can and will surely entertain the mass of people who drift in and out of the restaurant’s upstairs area to spectate on the event. That player can also ask for and will be deserving of free pizza slices from admirers. Are you worried the administrators will have technical difficulties and won’t be able to get everyone jacked into the LAN or accommodated on WiFi ? So a I .. and that’s why I’ve asked Ahmad Zehour from A2zPC computer repair to stop by at nine am that morning and be on standby until noon. Ahmad lives and works just one block north of Amicos on Dundas St W at Roncesvalles Ave.
Any questions? comment for answers. I’ll update this post with pics and more details on sponsors prior to the event. 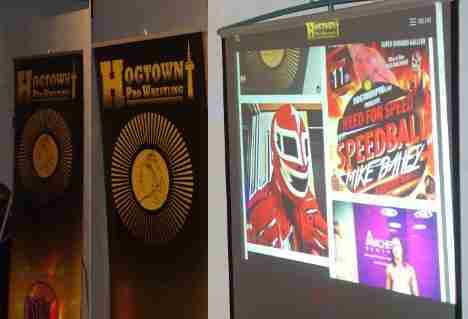 Amico’s Pizza continues to sponsor Hogtown Wrestling and was especially proud to help the league produce their Friday 11th November 2016 Need for Speed event. This night featured some truly exceptional wrestling as fourteen different athletes hit the mat, each motivated to win fame and acclaim on their rise to the top. 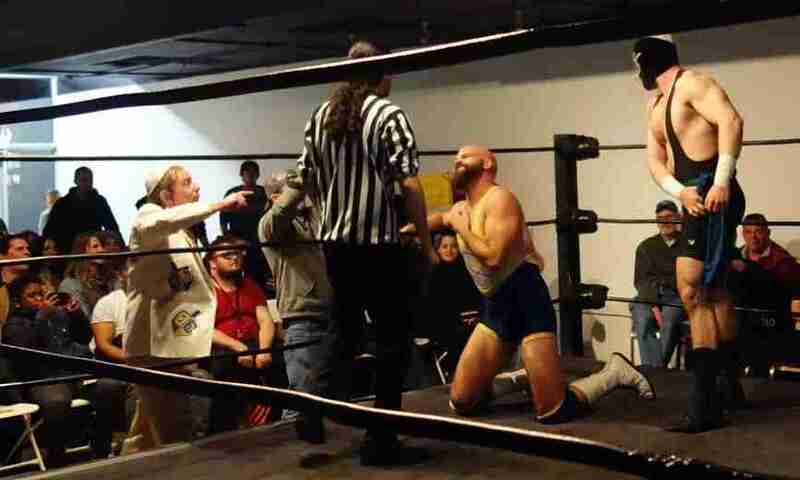 Read about who rose and fell during the matches on the Hogtown Wrestling Blog. Here are some highlights we captured from the match-ups. Below is CL Volino being abused by Bruiser Brakken. 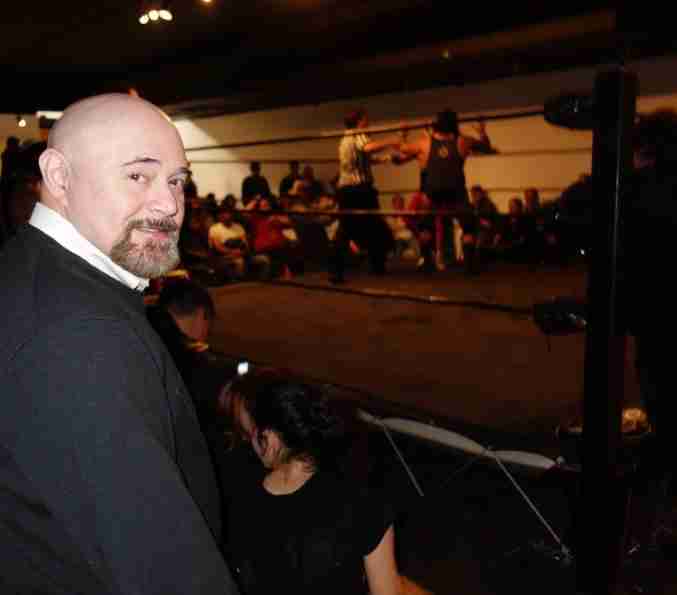 Above, Roger from Dine Palace watches the action is amusement; his organization donated the huge new vinyl ring apron to the wrestling league. They made it extra large so that it will better accommodate the new ring that is on order for the 2017 matches! Below is Goliath Ayala who took on Speedball Mike Bailey. Below the camera captures Jim Nye the Science Guy moments after he had his arm wrenched backwards by The Sumerian Golem. Both of these characters benefited from 3rd party sponsorship, besides eating our pizza. Jim got a half hour massage from Toronto Physiotherapist Damian Wyard of Pilates4Physio and The Sumerian Golem tried the spa and vitamin drips at Jaconello Wellness Centre and is the star of a funny video wherein the masked wrestler tries every treatment in the clinic. Here’s a nice wide shot of the backstage area where wrestler’s change costumes and where they eat our pizza before and after their matches in the gallery. 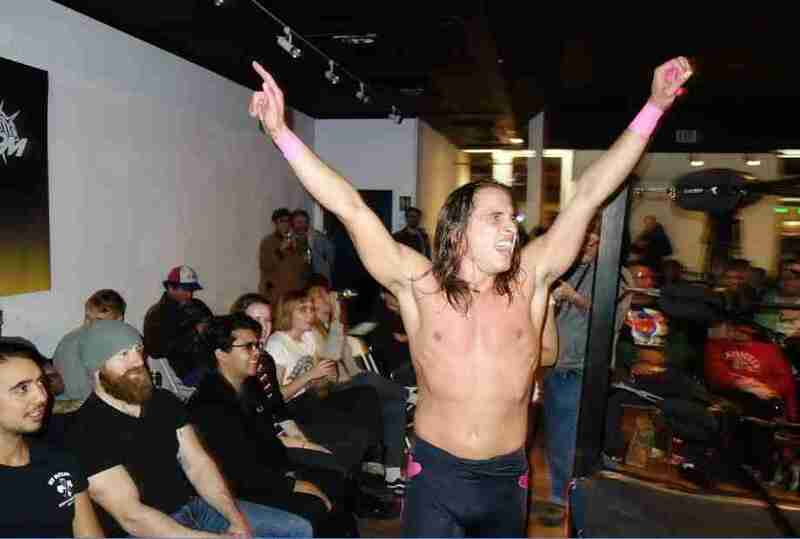 Hogtown Wrestling has introduced a video projector to the live shows, and on Friday night they were using Hashtagio to curate Instagram and Twitter pictures of the wrestlers. This interactive ingredient makes the shows even more entertaining. 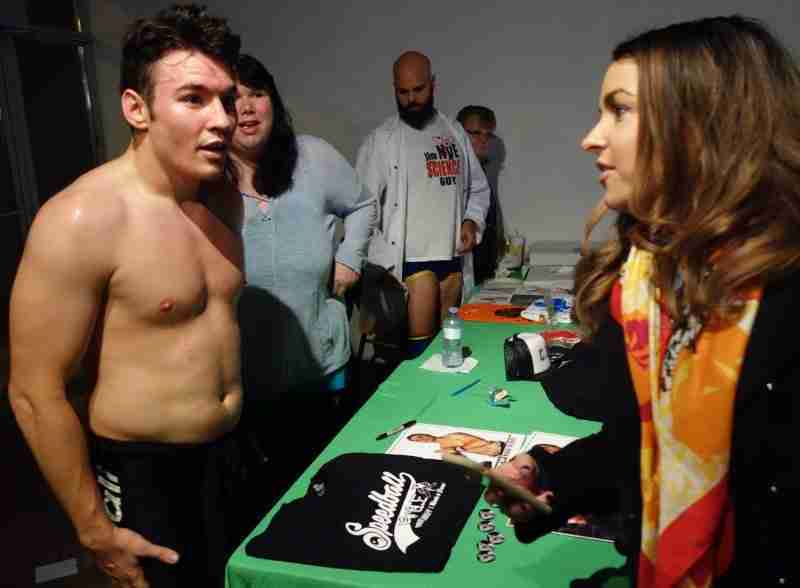 Below is Speedball Mike Bailey who was the star of the Need for Speed event posing for a picture beside an obviously adoring female fan – the photo is not staged. This girl really was looking at her hero with pizza dough eyes. 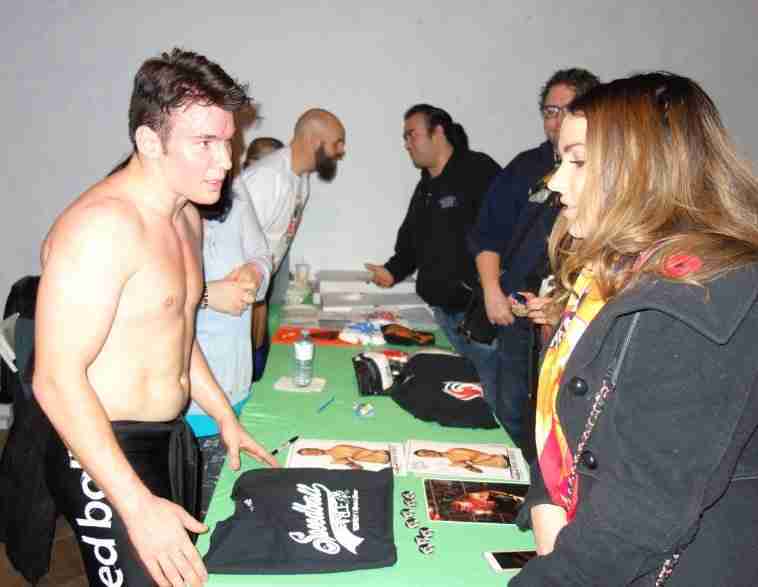 These two veteran wrestlers both had amazing matches that night, and the crowd that greeted them was genuinely interested in buying their collectible merchandise. Wrestling posters and 8×11 glossy photos can be quite collectible and each one they sell is another brick in their reputation tower. Below is Shannon Tebb from Shanny in the City, the Ring Girl at the Need for Speed show. This person is part of the show and poses with sponsors – she sits near the ring and gathers clothes and props and excess gear and keeps such items safe while the wrestlers do battle in the ring. Behind her, deep in the sponsor section (the safest area still close to the ring) is John Conn from Standard Telecom office phone systems and Ahmad Zehour from A2ZPC computer repair who both starred in a terrific video about the office phone hacking and PC virus removal story core to the Hogtown Wrestling league name change and the myth making that is helping make this sports theatre so special and so well integrated into the community. 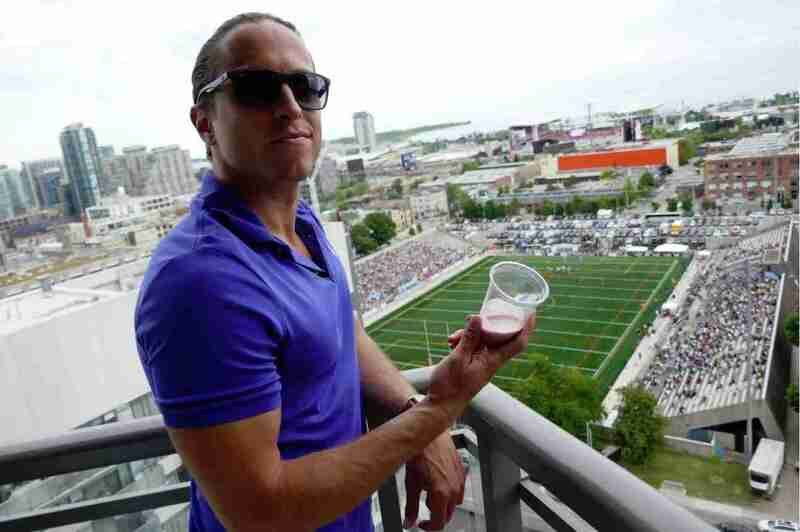 Below is Martin Casanova, the Latin lover. If you look closely at the picture you can see he’s wearing a custom sports-guard made by Archer Dental that says ‘The Lover’. A sports guard covers the top row of teeth only, allowing the wrestler to call out in comprehensible language during the match. Above is Wrecking Ball giving the knee bend crux to Eddie Sapps! Here’s Laura Bilotta the Toronto matchmaker from Single in the City with John Macintosh from Hashtagio social media aggregator just before the start of Laura’s Singles Pizza Making Night, a unique networking event held here at Amico’s Pizza. Singles Pizza Making Night at Amico’s Pizza in Toronto! Frank got the call a month ago, and he said yes to Laura Bilotta when she asked to bring twenty-four single people to our historic Parkdale restaurant at the start of November 2016. 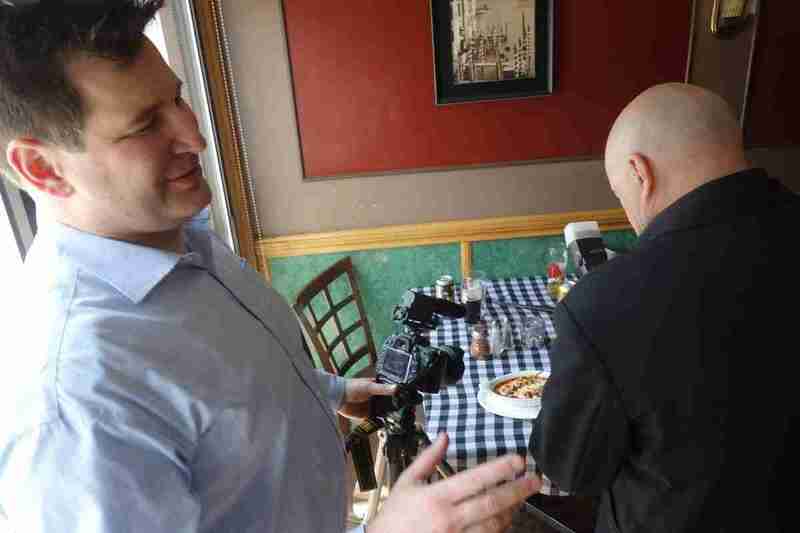 He said yes because over the years Amico’s Pizza has been the meeting place for many married couples; we frequently get people returning to where it all started for them a decade ago or longer. If you’re one of those people who met your lover here in the nineties or 2000’s please don’t hesitate to contact us for a deep discount anniversary pizza! As usual, our man Frank Horgan ran the kitchen and made sure that everyone who participated in the event and who came back into his realm to make their pizza had the correct amount of dough, and applied the proper amount of sauce, and sprinkled on enough seasonings, and had full access to countless fresh ingredients. That’s all they needed as Frank took care of all the cooking. Here’s Mr Horgan with his son beside him at the top of the night. 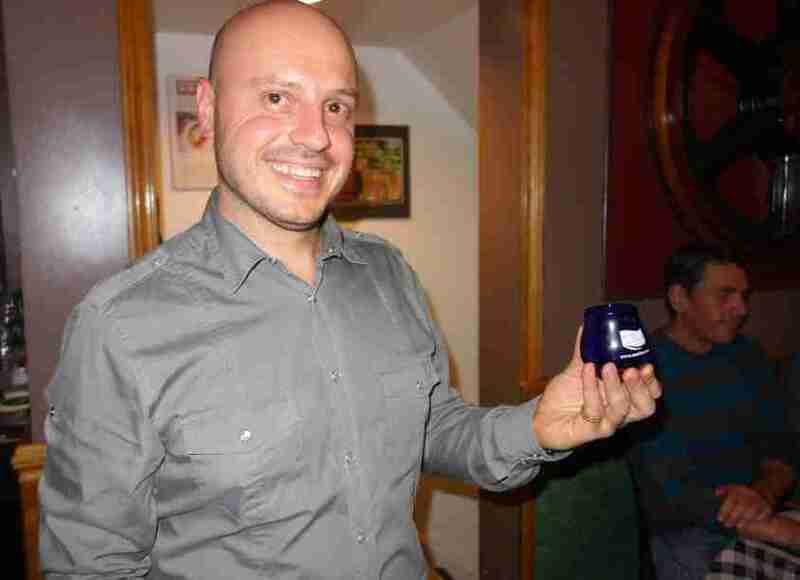 Angelo Tramonti from Sarafino Foods generously donated an authentic olive oil tasting experience! Angelo Tramonti, the boss at a local olive oil importing company Sarafino Foods brought samples of four different oils from four different olive tree varietals and gave the audience an amazing taste experience. He took everyone to Italy in their mouths for a moment and won our hearts forevermore with his knowledge and perspective. 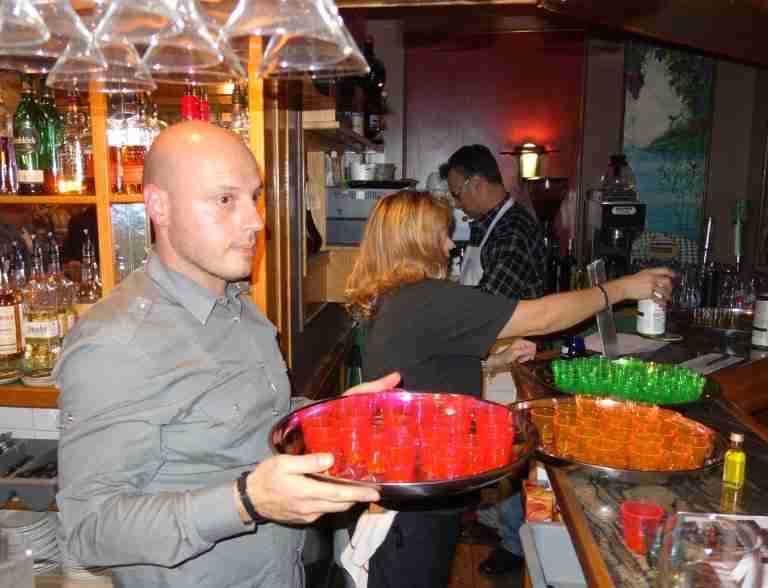 By putting the four different oils in four different coloured shot glasses, Angelo was able to demonstrate the subtleties of the product in a way that many of the attendees had never experienced before. 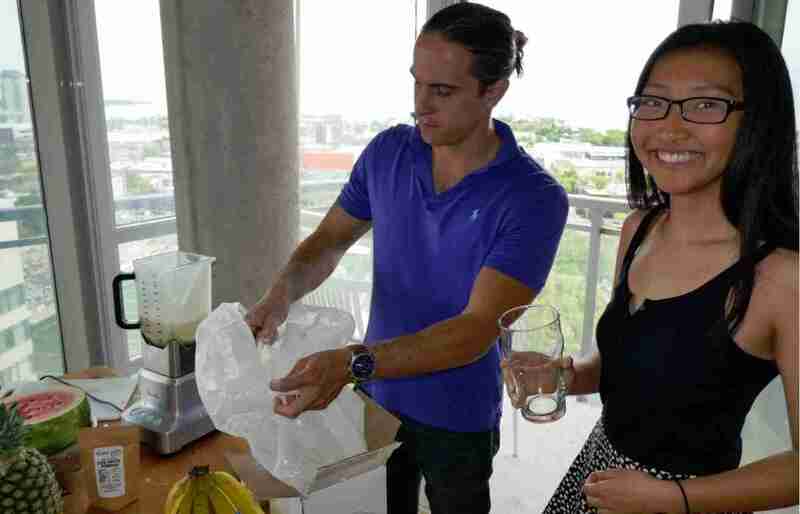 Plus he gave each participant an unopened taster bottle so they could go home and impress their family and friends with their knowledge. The screw cap bottles are resealable so they can do this many times. Angelo offered the group four different olive oils to try, but not before first telling them that they’ve probably never tried real olive oil before in their entire lives. He used the outrageous comment to spark a discussion on the fraud that’s happening on supermarket shelves today regarding the way the Canadian government lets olive oil distributors use misleading labels so consumers don’t realize they’re buying inferior product. There needs to be more public awareness about this issue and Angelo is on a mission to educate consumers and demand change. Meanwhile, back in the kitchen, each participant was given an apron and two minutes at the counter to add tomato paste and seasonings and then garnish their own very personal pizza anyway they liked. 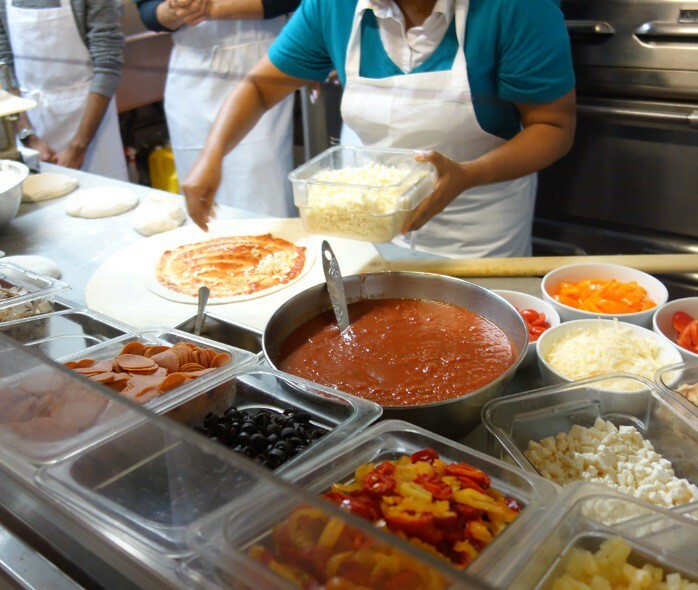 There was a massive array of toppings for the pizza-making participants to choose from, including a variety of exotic ingredients like capers, pickled onions, asparagus, basil and other specially imported meats and cheeses in addition to the arsenal of regular toppings present at the counter. 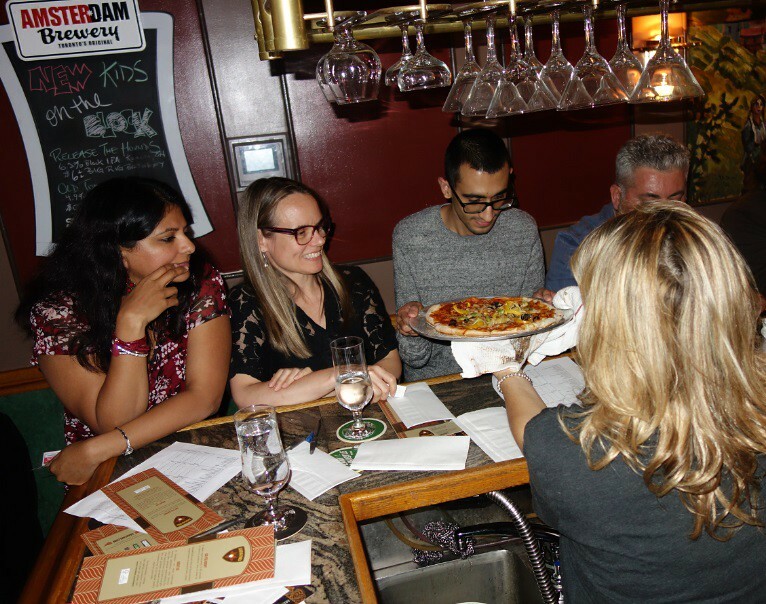 At the end of their chef experience, each artist had to sign the pizza somehow, and make some distinctive feature so they could identify their work when it was cooked and brought out hot later on. 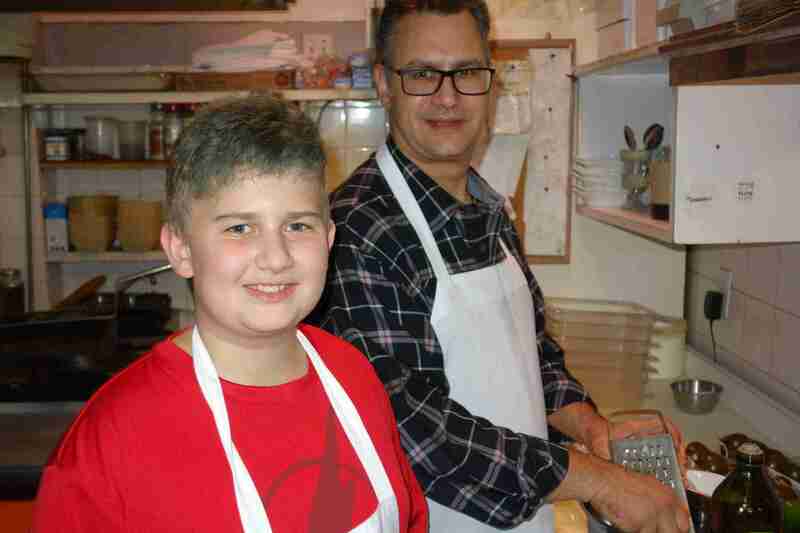 Each group took about ten minutes to complete their cuisine creations and there were six groups or twenty four individual pizzas made in total. Twenty five pizzas actually, as Laura went last and made a wicked Za with everything she liked most, and Frank was truly amazed at her creativity. Her pizza creation, the Single in the City pizza (for two) may be featured on the Amico’s Pizza menu next summer, so I wont give away the ingredients now as we’ll likely have a patio party and debut it. 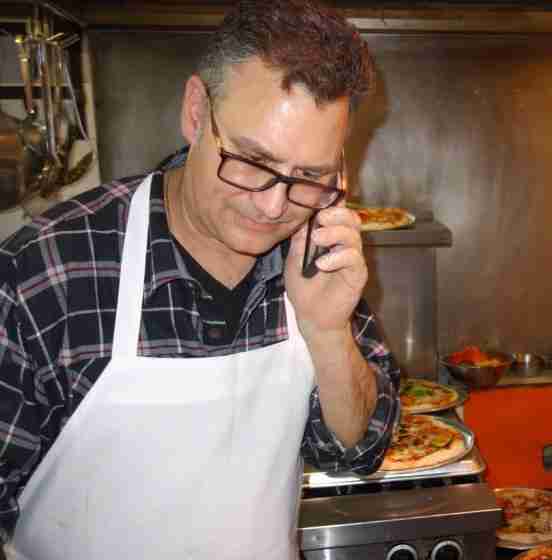 Frankie guarded the custom pizzas waiting to be cooked as they stacked up behind him in the kitchen. Now with Laura’s pizza ready to go, the pies were loaded into the oven six at a time to be finished and served hot to the waiting crowd all at once. As Angelo wrapped up the olive oil tasting in the main dining area, the smell of cooked pizzas wafted through the restaurant and drove everyone crazy. As everyone knows our legendary Italian eatery also has a back patio and the smell o9f pizzas had one couple walking through the back lane stop and ask if it was possible to buy a pizza from a participant! 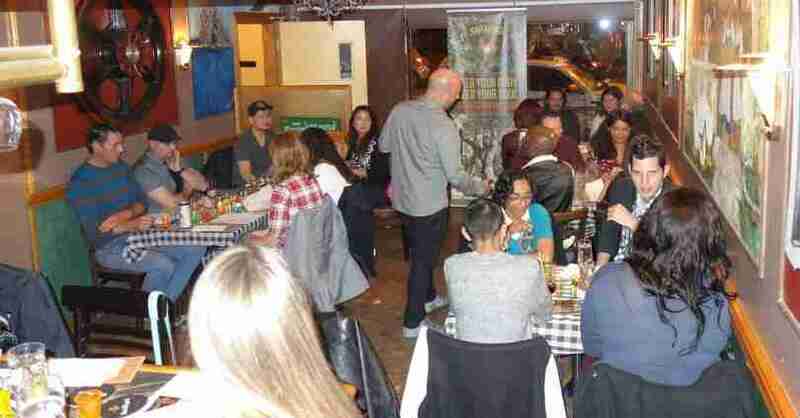 I’m not sure if that attendee sold their pizza but regardless our events do impact the neighbourhood. 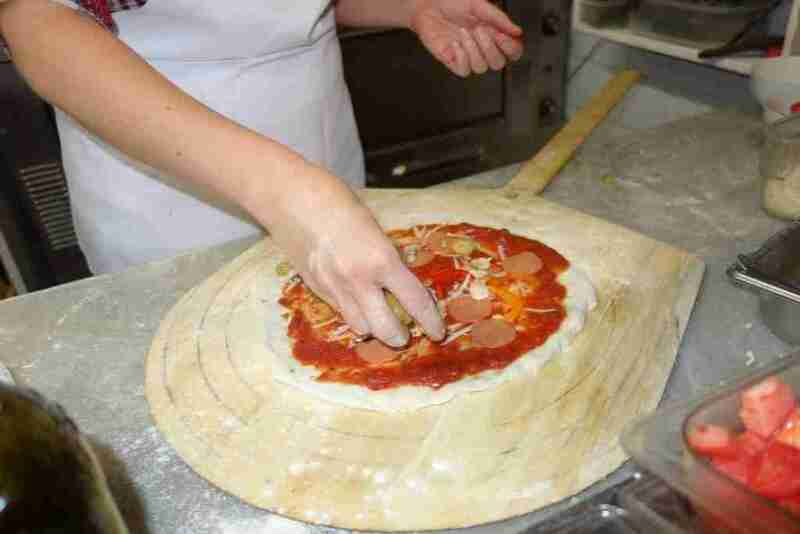 Frank had been half baking the pizzas just to get them started, and now finished the pies off in a group bake to slice them and send them out to the waiting chefs. The hungry event attendees lined up at the bar to claim their work and eat and share their pizzas while they were still piping hot. After that the evening came to its delicious conclusion with everyone mingling, sharing and eating their pizzas. 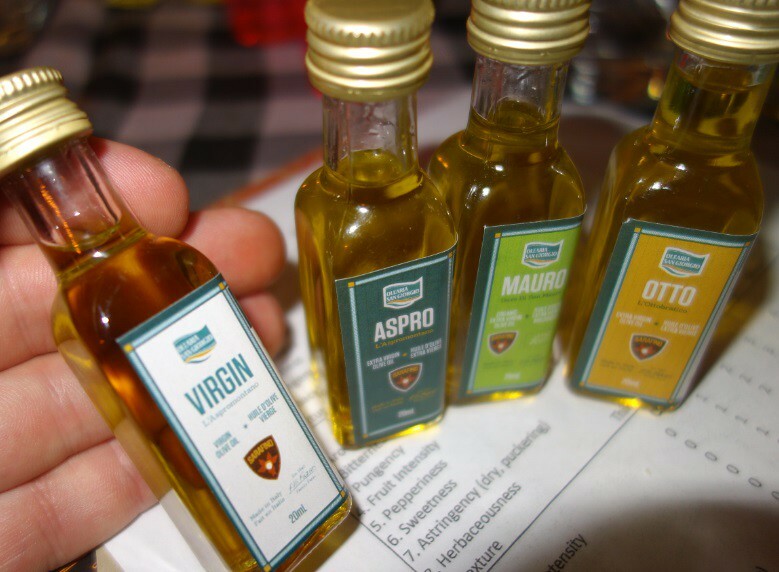 As mentioned earlier Angelo gave everyone four small olive oil tester bottles to take home with them and these combined with the left over pizza slices made the event very worthwhile for attendees, some of which also collected phone numbers !